By the 1940s there were several Air Units in the Argentinian Army and the Navy; the 1st step towards an Independent Force came on 11 February 1944 with the establishment of the Aeronautical Command, which would go on to become the Argentine Air Force on 4 January 1945, an Independent Force on a par with the Army and the Navy. On July 11, 1947 English Pilot William Waterton climbed into the Cockpit of a Gloster Meteor G.41G F.Mk.IV, started the Engine and headed for the Runway Head, which was nothing else but Edison Avenue, in The Port of Buenos Aires. From there, he took off and headed towards the Argentinian Air Force Base “El Palomar“; that was the 1st Flight of a jet fighter in Argentina. The Gloster, as they became known, were the 1st Jet Engined Fighters in Latin America, given to the Argentinian Air Force, together with the Avro Lancaster & Lincoln Bombers, an extraordinary strategic power not to be repeated in the Region, The Argentine Air Force ordered 100 F.4s in May 1947, comprising 50 ex-RAF Aircraft & 50 newly built, Deliveries started in July that year; the Meteor remaining in Service until 1970. Immediately after the end of WW2, in which the Argentine Air Force took no part, it began a process of modernisation, incorporating Aircraft such as the Gloster Meteor Jet Fighter, thus becoming the 1st Air Force in Latin America equipped with Jet-propelled Aircraft. In addition, a number of Avro Lincoln & Avro Lancaster Bombers were acquired, creating a powerful Strategic Force in the Region. The Air Force, with former Luftwaffe Technicians, also began to develop its own Aircraft, such as the Pulqui I & Pulqui II, making Argentina the 1st Country in Latin America and the 6th in the World to develop Jet Fighter Technology on its own. At the end of WW2, Argentina was benefited by its Neutral Country condition along most part of the Conflict. On one side, there was the great immigration to this Country of German Scientists, Technicians, & Pilots who gave a great boost to the local Aeronautic Industry, which achieved its golden years. On the other, there was the great debt that England had acquired with Argentina during the War, food & raw material which they offered to pay with Manufactured Products, because they didn’t have currency at that time. The winners had a lot of War Surplus material, so England offered to pay the Debt with Military Equipment of all kinds, even though this decision didn’t appeal to the United States. Among all this material there were many Aircraft, but there was a special “lot” of 15 Avro Lancaster Heavy Bombers, 30 Avro Lincoln, and 100 Jet Fighters Gloster Meteor G,41G, Mk. IV, with a little less wingspan. At the beginning of 1947 the Test Pilot for the Fábrica Militar de Aviones (FMA), 1st Lt. Edmundo “Pincho” Weiss, was sent to the UK in order to make an evaluation of the equipment and there, he became this 1st Argentinian Pilot to fly the Meteor. A little after, another 11 Pilots with experience in the Curtis Hawk 75-O, (inset) the main Argentinian Fighter Plane at that time, were sent to England to begin their training as Jet Pilots. There, they had the chance to fly the Avro Anson, in order to get used to a 2 Engine Aeroplane; the de Havilland Dove, so they could learn the Landing Technique with a Tricycle Landing Gear, and the Gloster Meteor Mk.III. After each Pilot had the chance to fly for about 6 hours in that Plane, they took Command of the 6 Argentinian Airplanes. On June 6, 1947, 6 Gloster Meteor G.41G Mk.IV were registered, the register numbers were I-007 to I-012, and those Planes were used for Training Purposes. After a Training time of 60 hours, on 8th August (according to the Memoria Anual del Regimiento 4 de Caza Interceptora, R4Caz, de 1947) they were discharged and replaced by a new Group. 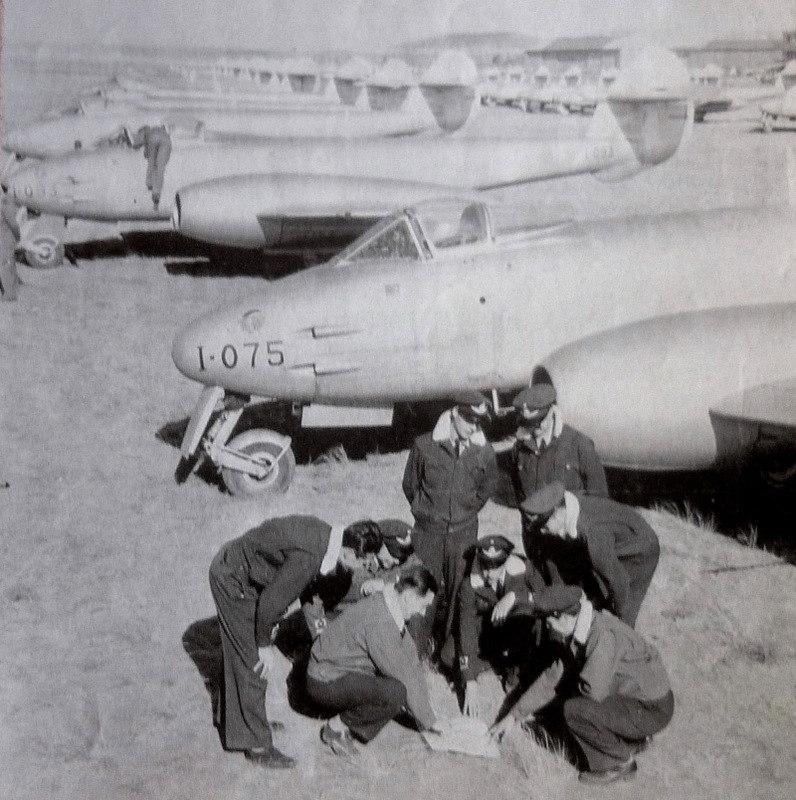 Argentine Pilots excited with their brand new Gloster Meteor fighter I-075 unpainted yet. Autumn of 1947. The Argentine Air Force came to have 100 of these Aircraft. The 1st Planes were delivered by Ship to Buenos Aires. On 8th July, the I-001 to I-006 arrived to this Country. In order to get them to the Air Force base “El Palomar“, they had to ‘improvise a Runway‘ at the Avenida Edison, and from there they took-of heading to the Base. On 19th July, they participated on an “Aerial Parade” that impressed the crowd who had never seen a jet plane before, and from September 7 to September 30, they were at an Aeronautical Exhibition, together with other new Airplanes, at the Avenida 9 de Julio. Those Planes were carrying the registration number I-003 and the I-006. On 3rd December 1947 the 1st Flight Unit was created, having the Gloster Meteor as its backbone, this was the: Regimiento 4 de Caza Interceptora R4Caz, (according to the Official Decree No.37993, published in the Boletín Aeronáutico Reservado, BAR, 260), at the Base Aérea Militar (BAM) Tandil, in the Buenos Aires Province, although the Planes were registered on March 3, 1948. The Air Base was improved and widened in order to accommodate the new Airplanes, while the Technicians & Mechanics were adapting themselves to the new characteristics and “Secrets” of these new Fighters, a totally unknown concept in this part of the world. They faced a lot of problems because the Planes were very tricky and there were many incidents, during the 1st days of Operation. We must consider that the Meteor was a quite primitive Jet Plane, which had many of the piston-engined motor concepts, with a Jet Engine on it. Even the power put out by the Rolls Royce W.2B/37 Derwent I Engine, was far superior to what the structure could handle. The next planes that arrived in Argentina, were assembled little by little at the Instituto Aerotécnico (FMA), at Córdoba, until the total number of 100 were completed. During the unloading Operation, the whole Fuselage of No.I-021 fell into the water and it had to be replaced, although this replacement didn’t come until 1949. Another incident came when unit No.I-005, had an accident 9 days after it started Service; this kept this Plane out of service for more than 3 years. The 1st Gloster lost in flight, was the I-018 which exploded coming out of a “barrel” Manoeuvre on 23rd April 1948, while being evaluated. This Plane was prepared in order the establish a new speed record in a closed Circuit, which it could not be achieved. 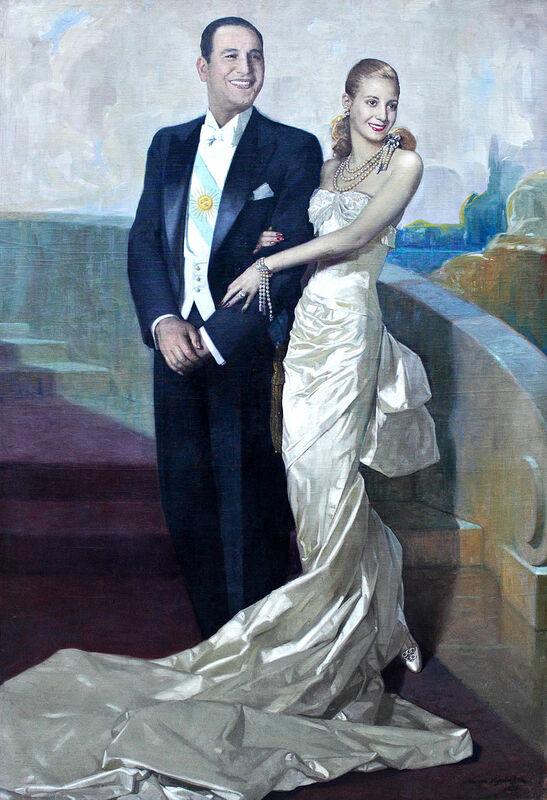 Eva Perón, the wife of President Juan Perón, died on 26th July 1952. The Vickers VC.1 Viking was a British Twin-Engine short-range Airliner derived from the Vickers Wellington Bomber and built by Vickers-Armstrongs Ltd at Brooklands at Weybridge in Surrey. 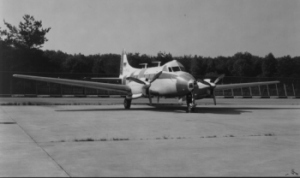 In the aftermath of WW2, the Viking was an important Airliner with British Airlines pending the development of Turbo-prop Aircraft like the Viscount. An experimental Airframe was fitted with Rolls-Royce Nene Turbo-jets and 1st flown in 1948 as the World’s 1st pure Jet Transport Aircraft. During WW2 Argentina was the only country in Latin America not to receive Aircraft from the US through the Lend-Lease-Program, because Argentina remained Neutral. Because of this situation the capacities of the FMA were extended and 199 FMA I.Ae. 22 DL were built from 1944 & 101 FMA I.Aé. 24 Calquin tactical Bomber from 1946. Comando de Fuerza Aérea Argentina (FAA) was formed on 4th January 1945 and the Air Force became an Independent Service. After WW2 the FAA received some Training & Transport Aircraft from the United States, such as Beech AT-11B Kansan or Douglas C-47A Skytrain, but bought many more Aircraft from the United Kingdom, such as Bristol 170 Freighter or Vickers Viking Transport Aircraft, Avro Lincoln BMk.II Bomber, Gloster Meteor F.4 fighter & Percival Prentice Training Aircraft. From 1947 the Service also received additional Aircraft from Italy, Fiat G.55A/B Centauro Fighter (inset) and Fiat G.46-2 Trainer Aircraft – 30 were supplied to Argentina. Argentina returned 17 that were then sold to Egypt in 1948, being armed with 4-12.7mm machine guns. A 2-seat Trainer version, the G.55B was built in 1946 with 15 going to Argentina in 1948. The Bristol Type 170 Freighter was a British Twin-Engine Aircraft designed and built by the Bristol Aeroplane Company as both a Freighter & Airliner, although its best-known use is as an Air-Ferry to carry cars & their passengers over relatively short distances.